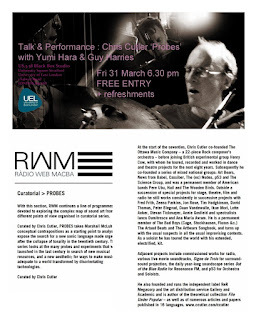 Chris Cutler torna a parlare domani ai fortunati studenti dell'University of East London - ma l'ingresso è libero e consentito a tutti - all'interno di una serie di incontri teorico-pratici dal titolo Experimental and Improvised Music Practice as Research. Al centro dell'attenzione la sua esemplare serie di podcast Probes, oggi giunta al ventesimo episodio, iniziata cinque anni fa in collaborazione con il Museo d'Arte Contemporanea di Barcellona e disponibile integralmente negli archivi di Radio Web MACBA. Il pomeriggio inizierà con una performance di Cutler con Yumi Hara e Guy Harries. Chris Cutler is a British ‪‪performer, author, and the founder/CEO of the independent label and distribution network ReR Megacorp that specialises in experimental music. He became well-known as a drummer of the 1970s experimental group Henry Cow. As a researcher, he was involved with The International Association for the Study of Popular Music from its inception in the early '80s and in his theoretical/critical book File Under Popular he proposed that ‘musicians themselves develop a theory of music and culture derived from their own practice’, an idea now resurgent in the concept of 'Practice as Research'. 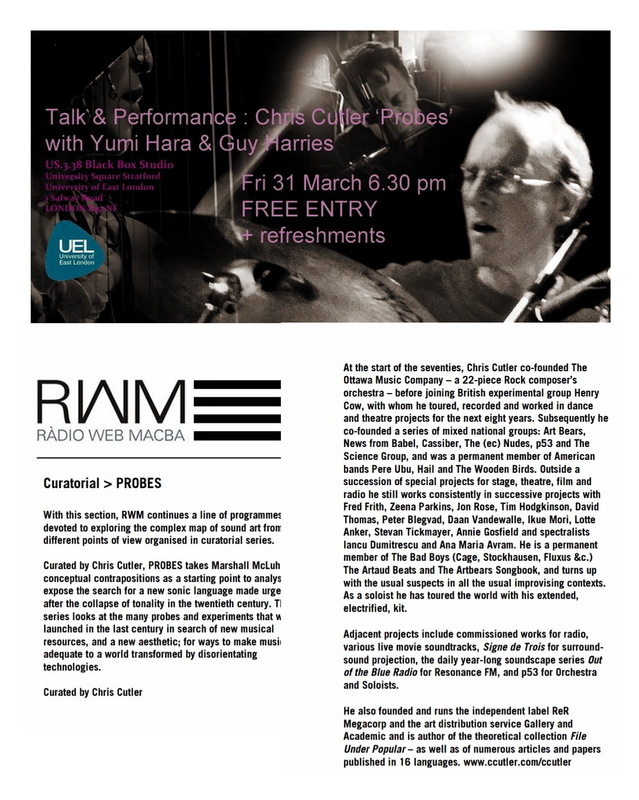 Chris will perform an improvisation set with Yumi Hara and Guy Harries, followed by a conversation regarding his ongoing podcast series. Probes combines research, theory, presentation and curation - a practical model of the value and possible mode of presentation for research output by practitioners.